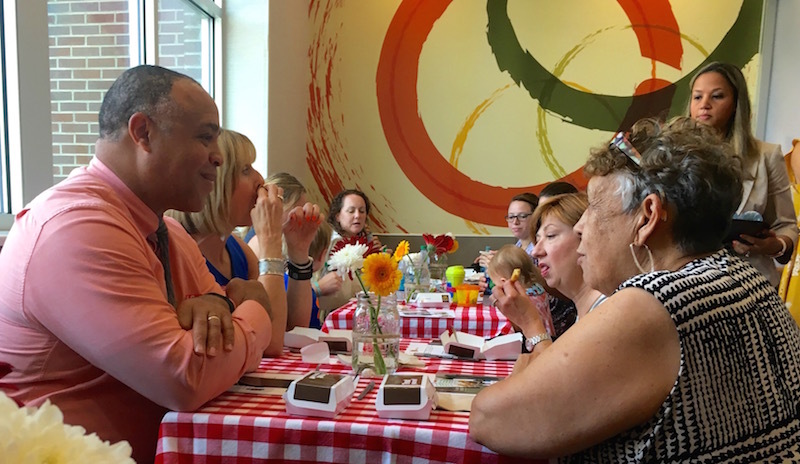 Cary, NC – Last week I was among a select group invited to a tasting at, of all places, McDonald’s. Ric Richards is the local franchise owner for all the Cary McDonald’s. He is proud to eat their food frequently and praised the company on the recent efforts to offer what is known in the food industry as clean label foods. 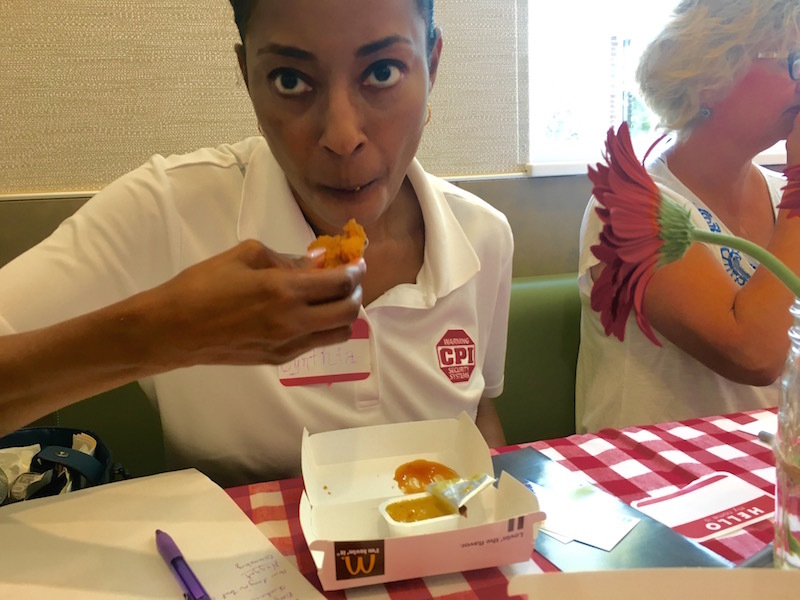 At the event, guests sampled the new McNuggets as well as the new chicken tenders. Not being a huge chicken nugget fan, I was happily surprised by the crispy bites. But it was the tenders that won me over. Ric called them full muscle chicken parts, meaning that it is not pressed together and contains nothing but a full piece of breaded white meat chicken. Complete with a choice of six sauces, these were crowd pleasers. The McNuggets and other chicken products are now free of preservatives and artificial colors, and the best news? They contain no antibiotics. This involves switching out all of the cooking oil in their entire system so that the fresh new oil hasn’t been exposed to previously cooked chicken that may have contained chicken meat treated with antibiotics. In Cary, the chicken tenders and McNuggets will soon be hand-breaded on-site. The chain changed the McNuggets to all white meat chicken two years ago. Richards said that throughout the company, they are listening to patrons and partnering with suppliers to make the desired changes possible. The antibiotic-free change came more than a year ahead of schedule. Other menu items are changing as the company makes the move to “Clean Label” foods. These include all of their ice cream products and shakes as well as all hamburger buns. They are eliminating high fructose corn syrup from these and other items. The company is also in the testing phase of cooking fresh-made burger patties. With over 14,000 restaurants in the chain, for food safety standards, all of the company’s burgers are cooked from a flash-frozen state. For the record, Richards made it clear that their burgers are all 100 percent beef. Milk in both their Gogurts and milk cartons is sourced from cows not treated with rbST, an artificial growth hormone. They’ve also refreshed their salads to include kale and an wider assortment of greens. Ric Richards, of The Richards Advantage McDonalds owns several Cary store locations. Of the area McDonald’s that Richards owns, two are Gold certified by the Leadership in Energy and Environmental Design (LEED). 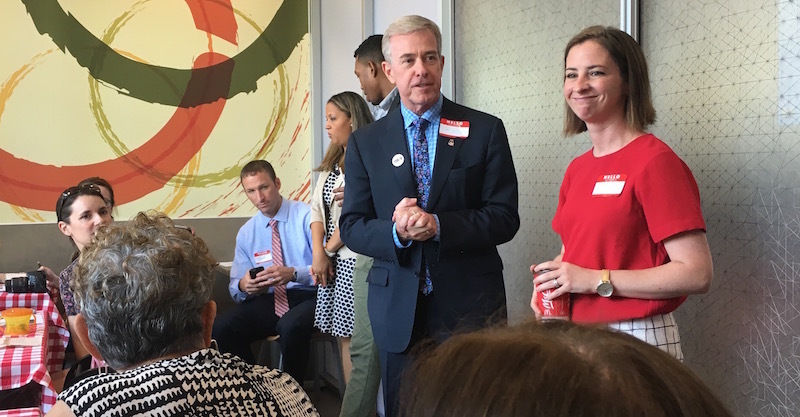 The Richards Advantage (Ric’s company) owns the most LEED certified stores of any franchisee in the McDonald’s chain and he aims to add more as he renovates older locations. Green practices make good business sense, whether its using recycled containers, composting your coffee grounds, using energy-efficient building materials or installing electric car charging stations (See earlier story). Some of the guests were concerned that McDonalds would change their famous fries. It’s been a long time since the chain swapped out the former animal fat-based oil for a healthier plant-based product. You can still get your Fry Fix! But remember- this is still fast-food. No one called it health food. Consume with moderation, and watch those calorie counts!